All during this year’s growing season, I’ve had a wonderful bunch of herbs growing in window boxes that line the railings on my balcony. It’s right outside my kitchen, and I’ve found myself using fresh herbs so much more when it’s just a few steps away. They’ve really thrived, too, because they’ve had lots of nips and tucks as I’ve used them, so they got all full and bushy and stayed healthy all year. I will definitely be doing it again! As it got cold, I started to wonder how I could bring them inside to continue to enjoy them. 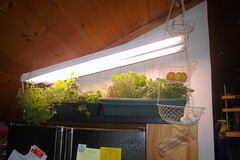 I have a huge set-up for window boxes under lights in my basement that Frank built for me years ago. It works really great for newly planted window boxes, and gives me a huge start on the season. But I know from experience that if I put stuff down there that I’m supposed to use in the kitchen, it’s two floors down and it just gets ignored and eventually dies, no matter how good my intentions. 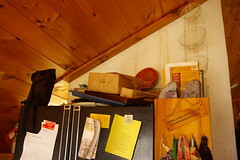 My kitchen is small — deliberately so. 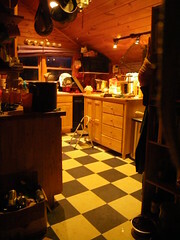 I like a cozy kitchen, and designed it that way when we rebuilt the house after the fire all those years ago. Frank thinks it is actually too small when we are both in there, which is true, but when I designed it, he never really helped out much in the kitchen. These days, we are often both in there at the same time, and it’s a little tight. So I really couldn’t think of a way to bring four window boxes full of herbs anywhere that wasn’t going to eat up the counter space that I need. I didn’t have any extra to spare. So I cleaned it all off, and Frank installed two shop lights with full-spectrum grow lights in the ceiling directly above the icebox. I put one of those rubber trays that I’d been using in the basement on my planting bench on top. 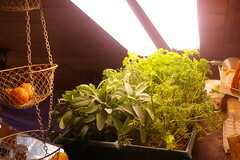 I knew it held four window boxes, which is the number of ones I had filled with just herbs. I’ve got one box with parsley and cilantro, both nice healthy plants that do well with frequent trimming. 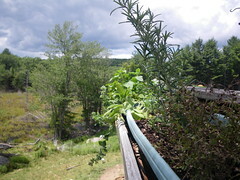 I’ve got one with sage that is doing great, and some thyme that never did well all year, but I’m nursing it along, and really nice and big rosemary plant. I’ve got one with a draping orange mint, some catnip, and some oregano, all doing really well. And one with just dill, and I should start some more in that same box. There might be space for a couple more boxes, and I think I’ll put some greens in, or maybe some basil and some chives, both things I use a lot of. I love them. The kitchen smells so good! I’m hoping the full-spectrum lights will help with some of my winter depression, too. Perhaps the extra humidity will help with some of the winter dryness. I think they should be easy to care for because I spend so much time in the kitchen already. It’s next to our chimney, so should get some heat from that, plus heat rises and it’s on top of the icebox, so I’m hoping they all get enough heat, despite the fact that we keep this house pretty chilly all winter. This entry was posted in cilantro, Herbs, Mint, Rosemary. Bookmark the permalink. Post a comment or leave a trackback: Trackback URL.